Digital Storytelling Lab member Frank Rose has published a feature-length essay in the spring issue of strategy+business, the global business quarterly, on immersive storytelling as a tool for brand marketing. Titled “The Power of Immersive Media,” the article defines immersion as “the process of losing oneself in a fictional world” and traces its evolution in history from the 17th-century adventures of Don Quixote (who went tilting at windmills because he’d lost his mind from reading too much) to the 21st-century development of virtual reality devices such as the soon-to-be-introduced Oculus Rift. 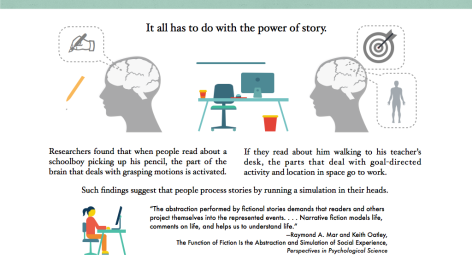 In addition, the article summarizes recent neuroscience and cognitive psychology research suggesting that storytelling in general, and immersive storytelling in particular, is more effective at changing people’s opinions than traditional advocacy messages such as advertisements. Rose, a frequent speaker at film festivals and marketing summits, is the author of The Art of Immersion: How the Digital Generation Is Remaking Hollywood, Madison Avenue, and the Way We Tell Stories. He teams with marketing expert and Digital Storytelling Lab member Paul Woolmington to lead DSL’s executive education seminar “Digital Storytelling Strategies,” a full-day program that’s co-sponsored by the Columbia University School of the Arts and Columbia Business School. “The Power of Immersive Media” documents and expands on much of the content of the exec ed session. The full article is available for download. And feel free to share the infographic below, which presents the main themes of the article in capsule form. “The Power of Immersion” by Frank Rose is licensed under a Creative Commons Attribution-NonCommercial 4.0 International License. Based on a work at http://www.frankrose.com/The_Power_of_Immersive_Media.pdf.